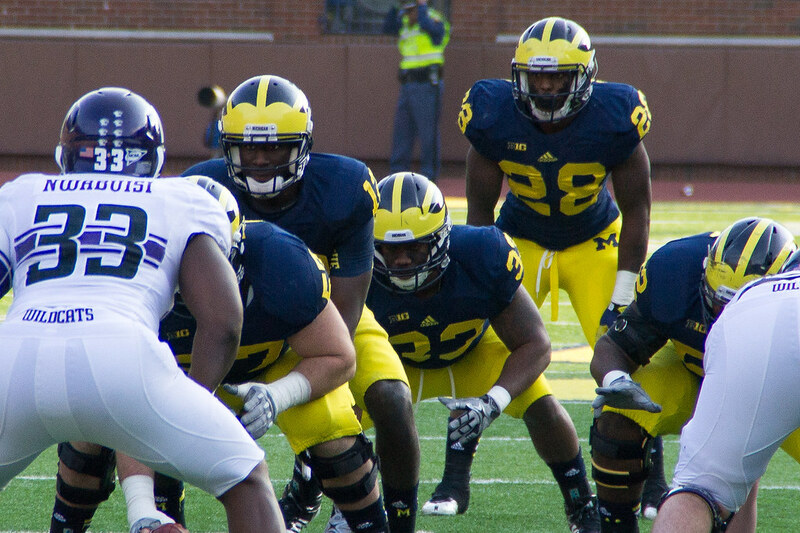 Will Michigan Be a Spread, Pro-Style or Hybrid Offense? Does it Matter? The look and feel of the 2013 Michigan offense is going to be a moderate, if not substantial departure from what was on the field for the bulk of 2012. In this, year one of the post-Denard era at Michigan, a return to a more pro-style attack is predicted. But just how different is Team 134's offense going to look compared to recent years? Nowhere else on the field is the difference going to be seen more than the quarterback position. Obviously, Denard was a special player at Michigan who sort of defined the QB role in his own unique way. Sure, he was a runner first and passer second, but that didn't mean he was relegated to being as one-dimensional as most pundits claimed. But now that Devin Gardner has taken over the starting spot, just how "pro-style" is the offense going to be? My prediction: Not as much as you might think. One of the only good things about Denard's nerve injury that he sustained in the Nebraska game last year, and Russell Bellomy's flame-out in said game, is that it forced Michigan to have to go with Devin Gardner. In his 5 starts at QB last year, Devin was 75 of 126 (59.5%) for 1,219 yards, 11 touchdowns and 5 INTs (one per game). He also ran the ball for 101 yards and 7 touchdowns. Not bad considering he spent the first 8 games of the season at WR. But maybe most of all was just the fact that the Michigan offense seemed to "click" with Devin at QB. Amazing what a tall, athletic, smart and capable QB can do for your offense that just played Michigan State and Nebraska in back to back weeks and only put up 21 points without scoring a touchdown. Once Gardner took over, Michigan averaged 32.8 points per game, whereas with Denard, we averaged 28 (which included a 63-13 romp over lowly UMass). Against stout defenses with Denard (Alabama, Notre Dame, Michigan State and Nebraska) Michigan averaged 10.25 points per game. Handy graph to illustrate the ups and down of the QB position in 2012. If nothing else, this chart illustrates that the overall output of offense from the QB spot improved (considerably) after the Nebraska game to at least a state of relative consistency whereas before, there was very little. Imagine if Denard had finished the 2012 season injury-free. Just how many questions would there be about Devin's ability to lead this offense? Those fears were assuaged with his performance in his 5 starts last year. 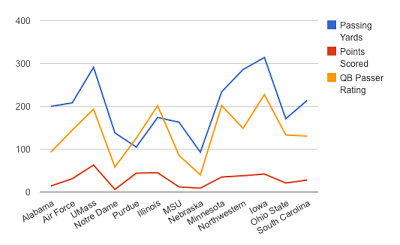 But questions about the overall scheme of Michigan's offense coming into 2013 still abound. Is Michigan going to abandon the spread altogether and reinstitute a traditional pro-style offense? I don't think so. Here's why. I fully believe we'll have the personnel to run the ball effectively, but that talent hasn't yet been proven. The unknowns outnumber the knowns for Team 134's offense. We know that we have two outstanding tackles, maybe two of the best in the league. But we also know that the interior of the line is all new. We know that Fitzgerald Toussaint can put up big numbers. After a disappointing 2012 campaign where he only managed 514 yards and 5 touchdowns, I'm sure he'd like a repeat of 2011 where he tallied 1,041 yards with 9 touchdowns. If given enough time to recover from his broken leg and a hopefully much improved offensive line are the case, then I suspect he could put up career numbers with ease. But keep an eye out for guys like Thomas Rawls, Justice Hayes and especially highly-touted incoming freshman Derrick Green who's already drawing a lot of attention. I don't think the starting RB spot is locked up with anyone at this point. Now of course we all know what guys like Jeremy Gallon (our leading returning receiver), and Drew Dileo bring to the table...even Devin Funchess to a certain extent. But there are many question marks in the receiving game. There are no proven wideouts. We're hearing Amara Darboh and Jehu Chesson getting a lot of attention this spring. They both had nice spring games, and I expect one or both of them to have a breakout year this year. But when your leading receiver is 5-8, that's an issue. I'm just going to say this right here and now – Devin Gardner is going to be a special player as the starting QB at Michigan. I think he has all the potential to be mentioned in the same breath as Cam Newton, RGIII or even Vince Young. I'm not saying he's there yet, or will ever get there...but he could. And that prospect should have Michigan fans excited. Denard was great at what he was great at. He could run, he was shifty. Devin is not going to light you up with his breakaway speed, but I think he does bring more to the table, so to speak, then Denard every could. If I'm an opposing defensive coordinator, I'm not looking forward to gameplanning for Devin anymore than I was against Denard...if not more so. If Michigan can get the passing game going where it's a true honest threat, and can back it up with one or two big playmakers on the ground, then Michigan could be unstoppable should they decide to sprinkle in some of the spread attack. Devin has flexibility, and I think Borges needs to embrace that...which I think he will. There's no question the 2013 Michigan offense is going to look different. Since 2008, Michigan's offensive attack has undergone some serious transformations, both for better and for worse. But so far, the 2013 outlook look positive (thanks to Devin's 5 starts last season), even though it could be quite different than what the previous few years have looked like.